Home > What is Unitarian Universalism? Unitarian Universalism is a liberal religious faith which values a free and responsible search for truth and meaning, the inherent worth and dignity of every person, justice, equity and compassion in human relations, and respect for the interdependent web of all existence of which we are a part. Our religious roots go back to the Protestant Reformation. Our earliest leaders questioned the rigid orthodoxy and creeds of the established Church. Unitarianism and Universalism both came to this country in the 18th century and found fertile ground. Throughout the following decades and centuries our commitment to the search for truth has enabled us to be open to the findings of the best in Biblical scholarship, to the truths found in other world religions, to the use of reason and the scientific method, to the sense of transcending wonder and mystery affirmed by all cultures which moves us to a renewal of the spirit and an openness to the forces which create and uphold life. We are a people of theological, spiritual, and philosophical diversity. We are a people who are committed to be a welcoming religious community – welcoming to diversity of culture, ethnic background, gender orientation, socio-economic background. We believe that such diversity helps to weave a tapestry of incredible beauty, strength, courage and support. We are a people committed to offering creative, engaging, empowering religious education programs for our children, our youth, our young adults and our adults. Our goal in these programs, workshops and classes is to open doors of individual and shared insight and understanding. We value the individual’s perspective, gifts, talents and questions. We learn and grow together through sharing and study and silence and fun! We are a people who enjoy being together as a community of all ages working and learning together, supporting each other and offering service to our community. Our congregation here in Cheyenne began in 1961 when several mothers began a U.U. group to provide liberal religious education for their children. That group grew and expanded to include adult Sunday services and programs for all ages. Cornerstones of our congregation continue to be openness to a variety of sources of religious and spiritual truth, creative and engaging lifespan religious education, and active social and community involvement. We invite you to explore our website fully and to visit us on a Sunday morning or for one of our many programs throughout the week. Unitarian Universalism is a religion with congregations across this country and Canada and in many foreign countries. 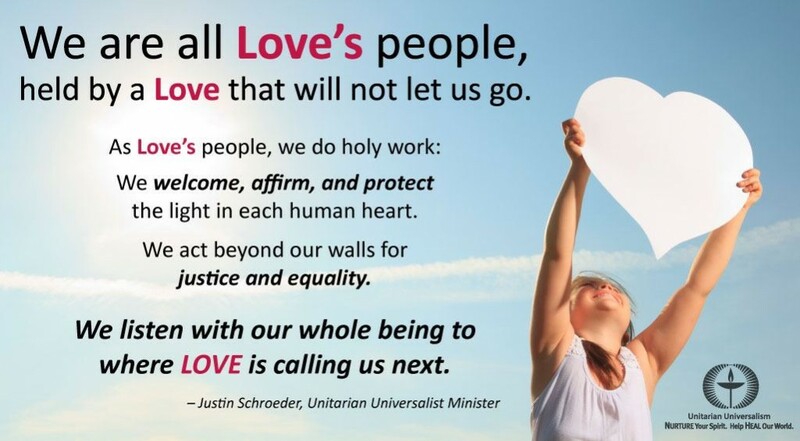 We invite you to visit the website of the Unitarian Universalist Association to learn more about the fullness of our movement.